Some of our flowers are hosting unwelcome visitors – aphids. 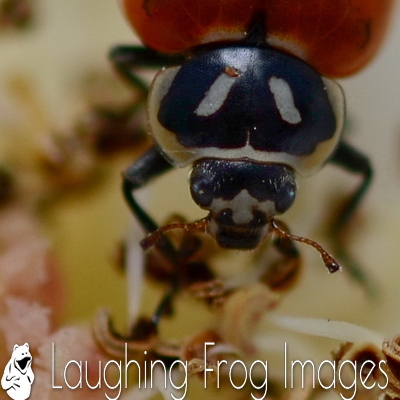 Mrs. Frog purchased some ladybugs to help in getting rid of the unwelcome guests naturally. The container on the counter that I thought might have been a pint of ice cream for me was actually full of 1500 ladybugs. So much for the ice cream munchies. It’s best to release them at dusk when things are cooling off – you set the container near where you want them to go, take the lid off, and the theory/hope is that they climb the plants you want them to climb and either move in or leave their larvae. In the process, you hope that enough of them stick around for dinner – that being the aphids. In the process, I thought I’d have some fun photographing the dinner rush. So, it was off to get the D5100, the 60mm f2.8 micro lens, the flash and the Gary Fong Lightsphere diffuser (so I would have even lighting and I wouldn’t get any hot spots). To provide for even lighting, I shot with the flash aimed straight up and let the diffuser do its’ thing. I know that sounds counter-intuitive – but see for yourself. It works! I could and should do a post about this diffuser – it’s a phenomenal addition to the camera bag for anyone who regularly uses any shoe-mounted flash. First off, ladybugs have the attention span of a cat. They don’t stay in one place very long. Second, I was trying to shoot them with a short micro lens with a flash and with diffuser as it was dusk. Not the greatest combination. All of this meant a wide aperture – which also meant my depth of field wasn’t going to be very much. Let’s just say that I had a less than 5% success rate that night. I’ll chalk it up to a learning experience, as I’d never tried this before. This image was made at ISO 100, 1/160 second and f3.5. I didn’t get any images that will end up in the Galleries on Laughing Frog Images. But that shouldn’t stop you from paying a visit anyway…! More importantly, I learned that night. (I’m not much for reading photography books – right or wrong, I like to learn new photographic techniques by trial and error. I’ve never taken a class or lesson, so why start now!? I’ll try this again – but it will be before dusk when there’s enough natural light that I don’t need a flash and can get my aperture above f8 – then I’ll at least have a fighting chance of success.